Your time is a valuable thing—so, you’re wondering just how much of it you’ll have to give up making this whole skydiving thing happen. Our day and age are marked by a penchant for instant gratification. 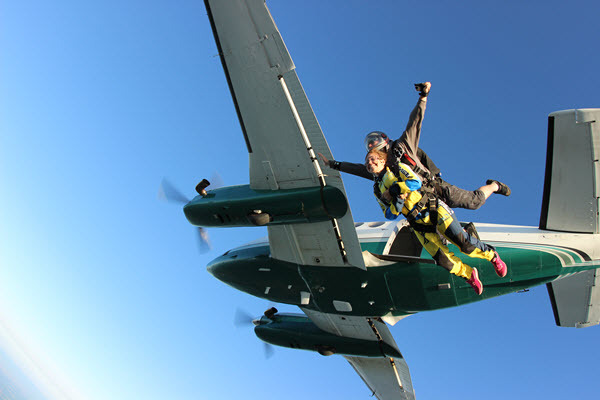 Most assume that their skydiving experience will be the same; it should be a quick in, up to altitude, and out. The reality, though, is a bit different. When you read through reviews for skydiving facilities, often you will find the discontent in negative reviews is directed at long wait times. Understandably, customers become frustrated when they have to wait without any apparent cause or explanation. Not to mention that longer wait times can build anticipation and leave time for those nerves of yours to multiply and intensify. Pretty soon, the butterflies in your stomach feel more like horseflies. It’s not pleasant: trust us, we know (after being in the sport as long as we have, we have gone through our fair share of waiting). Despite how unpleasant a long wait can be, we will say, not just for our facility but for any skydiving drop zone, no one is to blame. What people don’t know is that even a skydive operation which appears to be seamlessly running is at the mercy of a myriad of factors. There are just so many variables at play when it comes to getting skydivers in the air. Especially when safety is a concern, neither you or the drop zone have much say in the matter. Waiting patiently is the name of the game. We know it isn’t easy though, so here’s what you need to know about the skydiving process and some tips to help you make the most of your wait time, should you have one. Skydiving is a business unlike any other! Ask us if we’d rather have a “real job” or share our passion for skydiving with others, we will swiftly reply that this is where we want to be. In part, we are enamored with the industry because of the challenge that operating a skydiving facility presents. Running a drop zone is like a never-ending game of Tetris. Each day brings with it a new puzzle to solve. Each jump plane load has a certain number of open spaces (we call them slots), and each slot can be filled with or accounts for one jumper. So, a tandem pair of skydivers requires two slots, a single jumper one slot, another tandem pair with a videographer takes up three slots, a student skydiver and his or her instructor need two slots, and so on and so forth. On any given plane, there is a random grouping of jumper types: licensed skydivers, student skydivers and their instructors, scheduled tandem student skydivers with their instructors and video personnel, walk-in students etc. To paraphrase the famous Forest Gump quote “it’s like a box of chocolates, you never know what you’re going to get.” There is no way for the office to predict just who will show up, how many will show up, and what time people will actually arrive. There is one certainty: the plane can only hold so many people! One hitch in the plan can result in a bit of a domino effect that can increase wait times down the line for everyone. Even if the hitch is just an earlier group arriving late or having difficulty with their paperwork, it can gum up production and cause things to slow. Who knows whether the weather will cooperate! The air at altitude is our playground. It is also Mother Nature’s stomping ground. Skydiving is a weather dependent sport, and if there’s one thing we can all agree on, it is that no one can predict the weather. Generally, if you are experiencing a long wait time—the weather is to blame. It can be anything from a thick layer of billowing clouds obscuring the view of the ground from the aircraft, whipping winds on the ground or even a few thousand feet up, or even bone-chilling temperatures on the ground that make it unsafe to fly the aircraft. Either way, if it appears that it is unsafe to skydive, we won’t go. We care too much about the wellbeing of our customers, our staff, and the fun jumpers that call our drop zone home. Frankly, the risk is not worth it. Take a moment to stop and smell the roses. Okay, so at Skydive Tecumseh we don’t have roses. What we mean is that in our fast-paced society, it isn’t always a negative thing to take a moment to breathe. Your wait time doesn’t necessarily have to be a negative experience. Planning ahead for your trip to the drop zone can keep you from having idle hands and unoccupied time. If you prepare and set aside a few hours to spend at the drop zone, you will be ready for whatever the day brings—and who knows, you may be pleasantly surprised by how little time you spend waiting to skydive! In the case that you do have to wait, you can be ready to rock your wait with flair. We suggest you bring a book, newspaper or magazine along, maybe pack some playing cards or download that quirky game to your phone you’ve been eyeing, bring a few friends to pass the time with, or combine the two with group activities and a picnic. At Skydive Tecumseh, we have the perfect grassy picnic area for you and your entourage to comfortably pass the time. While we would love to have every variable that affects skydiving under control, we can’t. Rest assured, at Skydive Tecumseh, not everything is ‘up in the air’. There are elements we have full control over: the customer service you receive, the quality of your experience, and the cleanliness of our facilities. Because of our passion for skydiving as a life changing experience and sport, we have a commitment to provide you with the best first-time skydiving experience that we can, and we promise that our staff, our equipment, and our aircraft will give you an experience you will never forget! 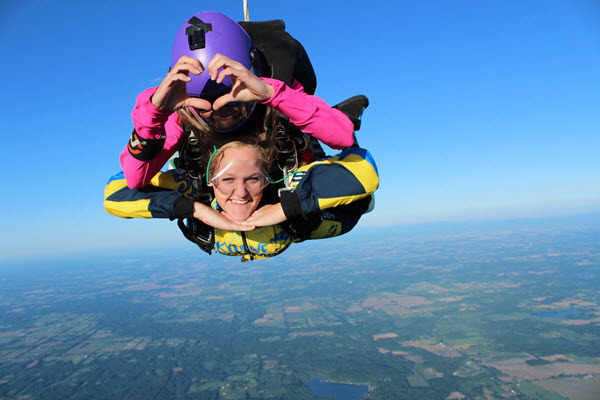 Check out our Skydiving FAQs page to answer more commonly asked questions.